With a stay at Krystal Cancun in Cancun (Zona Hotelera), you'll be a 4-minute drive from Cancun Interactive Aquarium and 6 minutes from Aquaworld. This beach resort is 2.4 mi (3.9 km) from La Isla Shopping Mall and 6.1 mi (9.8 km) from El Rey Ruins. Make yourself at home in one of the 502 air-conditioned rooms featuring fireplaces and plasma televisions. Cable television is provided for your entertainment. Conveniences include laptop-compatible safes and minibars, and housekeeping is provided daily. Enjoy Mexican cuisine at El Mortero, one of the resort's 2 restaurants, or stay in and take advantage of the 24-hour room service. Snacks are also available at the coffee shop/café. Relax with a refreshing drink from the poolside bar or one of the 4 bars/lounges. Buffet breakfasts are available daily from 7 AM to 11 AM for a fee. 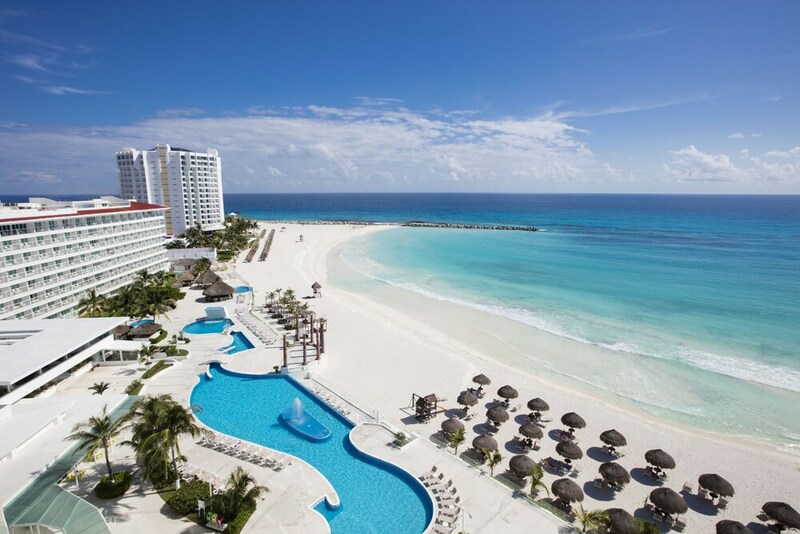 All-inclusive room rates at Krystal Cancun are available. These rates are higher because they include onsite food and beverages in the room rate (some restrictions may apply). The Krystal Cancun resort rises above the Caribbean Sea, within 1 block of nearby restaurants, shopping malls, nightlife, and the Cancún Convention Center. Guests have direct access to a public white-sand beach with umbrellas for shade. This smoke-free resort provides a fitness center and a full-service spa that includes a sauna, steam room, and rooms for massage (surcharge). It also offers body treatments, facials, and a small fitness room. Outdoor secure parking and valet parking are free. 5 meeting and conference rooms are on site. Guests booked in the All-Inclusive plan can enjoy set-menu dinners at select Cancún restaurants (transportation not included), and waived cover charge at Bulldog Café disco (drinks not included; other restrictions may apply). Aquamarina - Breakfast and dinner are served in this lively air-conditioned restaurant with pool/ocean view. The breakfast buffet from 7 AM to 11 AM consists of a wide variety of international as well as traditional Mexican dishes. At night an à la carte menu is offered. El Mortero - Hacienda-style meals including traditional Mexican dishes and a popular fish grill. Mariachi band. Dress code: Long pants, sleeved shirts, closed-toe shoes for men. Las Velas Restaurant - Menu includes snacks as well as buffet and à la carte lunch. Specializing in surf and turf. Located next to the pool. Open late morning to early evening. La Fisheria - Menu includes fresh seafood. Beach Club - Beach bar open mid-morning to early evening for beer, tropical drinks. Lobby Bar - Bar/lounge with big-screen TV. Open late morning to late night. Cascada Bar - Relax on your own swing seat with refreshing drinks served by the infinity whirlpool, open from mid-morning to early evening. A 137-meter (150-yard) sundeck overlooking the Caribbean Sea features a 68.5-meter-long (75-yard) freeform pool with a waterfall at one end, a swim-up bar at the other end, and an infinity edge in the middle. Adjacent to the waterfall end is a jetted tub and a 3.5-meter-diameter (12-foot) children's pool near a grass playground. During the winter, the shallow beach in front of the hotel disappears, but it builds up again in spring and summer. In place of the beach, there's a sand terrace furnished with lounge chairs for sunbathing and thatched-roof palapas for shade. An independent operator, AquaWorld, maintains a desk at the hotel for booking fishing trips and scuba diving/snorkeling excursions and for scuba-diving instruction. AquaWorld's main center is a marina 6.5 km (4 mi) away on Nichupté Lagoon, where many watersports are available, including kayaks, personal watercraft, sailboats, and parasailing and windsurfing gear. Other independent operators on the beach nearby sometimes rent personal watercraft and arrange parasailing flights. The prestigious Cancún Golf Club at Pok-Ta-Pok, designed by Robert Trent Jones Jr., is just 2 km (1.25 mi) away. The Harmony full-service spa offers a Turkish bath, manicures and pedicures, massages, body scrubs, aromatherapy and facial treatments. Only registered guests are allowed in the guestrooms. Some facilities may have restricted access. Guests can contact the property for details using the contact information on the booking confirmation. No pets and no service animals are allowed at this property.